High frequency hearing loss is what the name suggests ? it?s when a person loses their ability to hear sounds at the higher end of frequencies. For people with HFHL, it can be as though someone has removed certain letters from the alphabet in speech. For instance, F, S, T and Z are all said at a high frequency. This makes them hard to hear for someone with hearing loss at that frequency. Tinnitus. Tinnitus is a condition in which damage to the ear results in sufferers hearing sound or noise that isn?t there. It?s similar to feedback or ringing in the ears. The inability to hear specific sounds when background noises are present. This can mean that talking on a busy street could be quite difficult. The inability to hear sounds that are higher pitched. Trouble talking in groups of people or in places of background noise. Inability to hear some consonants. Infections like meningitis or influenza. Family history and genetics can be a contributing factor. Age. Hearing deteriorates with age to a certain degree, and this decline can be exacerbated by any number of other factors. Exposure to loud and constant noises can cause hearing to deteriorate over time. Smoking has been known to provide an increase in hearing loss. It doesn?t take much noise to damage the ears. A truck driving past, a loud bar, or a sustained noise can all do damage. It might not even be something noticeable at the time; rather, it will be a slow deterioration. This can make it hard to see if any actual damage is occurring. An example of this is going to sleep after attending a loud concert. If there is a ringing noise in the ears in an otherwise silent room, this is tinnitus 1 and suggests that the ears have been over-exposed to noise. Clearly the best thing to do is to be knowledgeable about the types of causes for hearing loss and how to avoid them. The goal is to become educated on the risks of damaging noises and to minimize any potential hearing loss as we age. We tend to regard intense sounds as singular events. This means that instead of taking in a whole day?s worth of exposure to loud noises, we see them as isolated incidents. For someone who works in a quiet office, this may be true. If it?s someone who works with heavy machinery, or in areas of high traffic, or even as a bartender, a day?s worth of sound exposure could be happening at levels that damage the ears. The best thing to do for limiting noise exposure is to start comparing noise to sunlight. Everyone knows the potentially damaging effect the sun has on our skin. We wouldn?t dream of exposing our skin to prolonged times in the sun. We know better than that: we cover up our skin, we use sunblock, and we get our skin checked for moles and melanomas. Only a very low percentage of patients will ask for a hearing test when they visit their GP. As it is request-only, there aren?t many of us who know the health of our ears. Prevention can be as simple as a pair of earplugs. These can range from heavy-duty work earmuffs that cover the whole ear to small, inconspicuous plugs for watching bands. Carrying around a pair of the smaller ones are a good idea, especially if you think you might be exposed to noise. It?s also important in an environment with loud noise to take frequent breaks from it. Any music lover should consider the volume levels they enjoy their music at, as many people turn music up far too high (especially with ear-buds). In these ways, protecting your ears is really quite similar to protecting your skin ? minimize your exposure and protect yourself. Should the worst occur and you have discovered some hearing loss, there are some options available. HFHL usually impairs the inner ear, which affects how sound is received and transmitted as signals to the brain. While there is no cure as such for hearing loss, there are a range of treatments and aids to improve the quality of hearing. A medical practitioner will be able to determine exactly what hearing loss you suffer from, as well as in what frequencies, and will be able to recommended treatment. Hearing aids, sound therapy and possibly surgery are all methods that are used to help amplify and possibly correct to a degree a person?s hearing. While there are treatments available, and there are new breakthroughs happening all the time in the field, the best measures to take are ones of prevention. Our hearing is a finite resource, and one that?s very easily damaged. There is only a limited amount of times the ears can be exposed to loud noises before they start to deteriorate. Caring for the ears is as simple as identifying the hazards and putting measures in place to either avoid or protect from these hazards. Obviously this plan will differ person to person: a truck driver might identify far different noise hazards than a full-time mother. A range of ear protection, from the large rubber earmuffs to smaller earplugs, are a great investment and should always be close to hand ? even for a brief use of the lawn mower. When aiming to treat, instead of only protect, The Hearing Loss Pill team has created a post specifically covering all of the available options which include everything from stem cell treatments to cochlear implants. You can read more here at our hearing loss treatment post page. Some data from studies is showing that high frequency hearing loss is actually getting worse in the main population, particularly in the youth. In a study made available from the National Health And Nutrition Examination Survey, during the years between 2005 to 2006 high frequency and unilateral hearing loss actually worsened significantly in the teenage population compared to the teens during the 80′s and 90′s. This is hypothesized to be due to noise induced hearing factors from an increase of noise in daily activities, including everything from normal environmental noise to the increased use of ear buds for music listening. 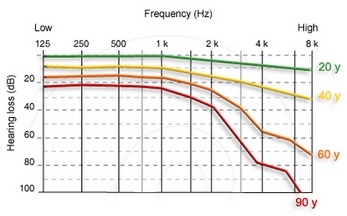 Q: What causes High Frequency Hearing Loss? A: Possible causes for HFHL include extreme noise exposure, genetics, aging, ototoxicity, and desease. 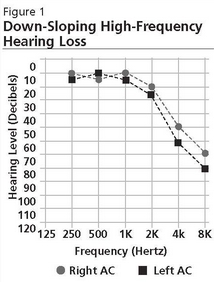 Q: How do hearing aids manage High Frequency Hearing Loss? A: Hearing Aids can take the higher frequency sounds, not heard by someone with HFHL, and lower the frequency one of two ways. Frequency transposition, the first option, takes the higher frequency energies and moves them to a lower frequency. The second way, known as nonlinear frequency compression, uses a compression ratio on the high frequency sound to lower it. It does not move the energy however, thereby avoiding mixing with lower frequencies.